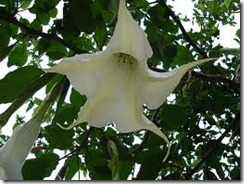 The angel’s trumpet (Brugmansia) is a bushy shrub with large, tube-shaped leaves. On some varieties the flowers reach up to 12 inches long. If the leaves on your angel’s trumpet are starting to die, troubleshoot the problem and restore the plant to optimum health. Stick your finger into the top of the soil to see if it feels dry. If the soil is dry, the angel’s trumpet leaves may be dying from lack of water. Water the soil immediately until it is wet to an 8- to 10-inch depth. Water daily during the growing season to keep the top of it constantly moist. Examine the leaves to see if there are small cobwebs on them, which indicates they are being eaten by spider mites. If you see cobwebs, spray all of the leaves with an insecticidal soap to kill the spider mites. To prevent spider mites from occurring in the first place or from returning, keep the soil moist at all times since the insects attack in dry conditions. Look up the nighttime temperatures in your area and determine if they are below 40 degrees Fahrenheit, which is the temperature at which angel’s trumpets start to die back. If temperatures are falling close to this minimum, lay a frost blanket or an old sheet over the angel’s trumpet plant at sundown to retain heat at night. Remove the covering as soon as the temperatures rise the following day.